UNIST News Weekly has been readily available for any student and employee, but it will be now only available to active subscribers. The staff of the Office of UNIST News and Communication at UNIST News Center interacts regularly with both the news media and members of UNIST community. 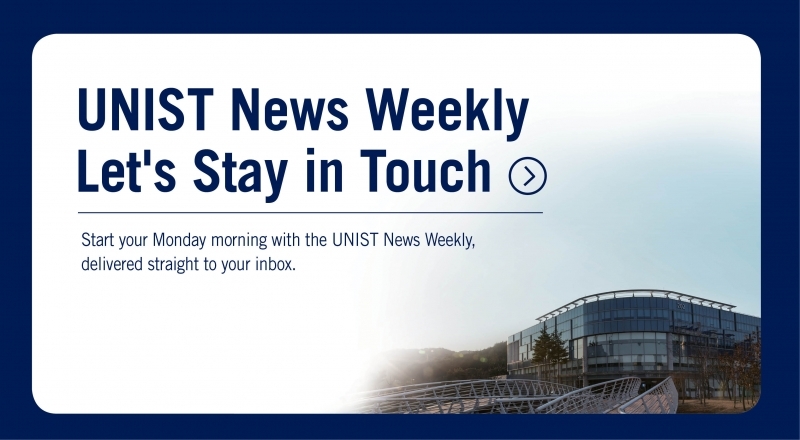 The UNIST News Weekly is an electronic newsletter that summerizes the latest news, media coverage, research discoveries, upcoming events, and more. New issues of this weekly online publication will be ready for active subscribers each Monday morning. Students, parents, alumni, and others are also welcome to subscribe. UNIST News Weekly aims to take readers inside campus classrooms, laboratories, and libraries, and across the globe where UNIST students, faculty, staff, and alumni are studying, teaching, and working to make a difference. Our weekly electronic newsletter replaces a full-length print article with clickable links, allowing readers to have an easy access to the full articles at a Web site. Moreover, you can also share news articles you enjoy with your friends, family, and followers. In addition to the week’s most memorable stories on technology, science, and more, the UNIST News Weekly also features an exclusive collection of campus images via a photo-sharing site, Flicker. Moreover, the newsletter also provides the latest on research highlights, student accomplishments, and alumni updates, all designed to reflect UNIST’s unique culture, energy, and excitement. Stay connected to receive groundbreaking scientific research, international initiatives, activities of UNIST’s faculty, students and staff, and more. For general comments or suggestions regarding the website, campus administrations, and community relations, please contact the office of UNIST Public Relations team.